From the frigid northlands of the Crown of the World to the steaming jungles of the Mwangi Expanse, the wilds of Golarion are as legendary as they are formidable - to say nothing of the adventurers who hail from these untamed regions! 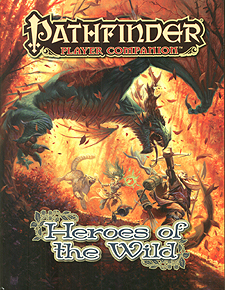 Embrace the laws of the wildlands, earn the respect of hardened wilderness natives, and command the powers of nature with Pathfinder Player Companion: Heroes of the Wild! Featuring dozens of all-new rules for wild characters - including feats, magic items, spells, and much more - Heroes of the Wild contains everything you need to make your characters as fierce and formidable as the wild itself! Details on prominent nature-focused groups on Galarion, including the Brimstone Haruspex, Storm Kindlers, and Wildwood Lodge. New traits for characters with a bit of the wilderness in their blood, and alternate racial traits for those descended from the fey. Tips and advice on surviving in the wild, concealing your tracks, and building camps and strongholds in the untamed wilderness. New equipment, feats, magic items, spells, traps, and other rules options to enhance your characters effectiveness when ranging far from civilization.